Basic Doctrines | Mormonism: Really Want to Know? It occurred to me while writing that title that I have a significant gap in my knowledge: I really don’t know much about what other Christian churches believe and practice regarding baptism. That ignorance was on display recently when I attended a Catholic wedding and noticed that the church had a pretty big baptismal font (not big enough for a waterslide, but bigger than a posh bathtub) and wondered out loud what it was for, since I am pretty confident that Catholics baptize by sprinkling. I asked my wife, a former Catholic, whether she thought that maybe the Catholics picked up the building on a foreclosure from an evangelical church. She gave me a dirty look that I interpreted as an invitation to pipe down. So I think I am entirely unqualified to do a compare-and-contrast with what other Christians do, and I’ll have to just settle for telling you what the Mormons do. First off, we do not have a waterslide. But that would be cool. 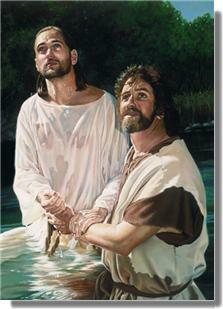 The Church of Jesus Christ of Latter-day Saints teaches that baptism is the first essential ordinance of the gospel. An ordinance is an outward act that symbolizes a covenant, which is a sacred agreement between a person and God. In the case of baptism, the ordinance consists of baptism by immersion, followed by confirmation as a member of the Church by the laying on of hands and conferring the gift of the Holy Ghost. The covenant is that a person agrees to accept the name of Christ and follow His commandments, and the Lord promises to cleanse that person of his or her sins. 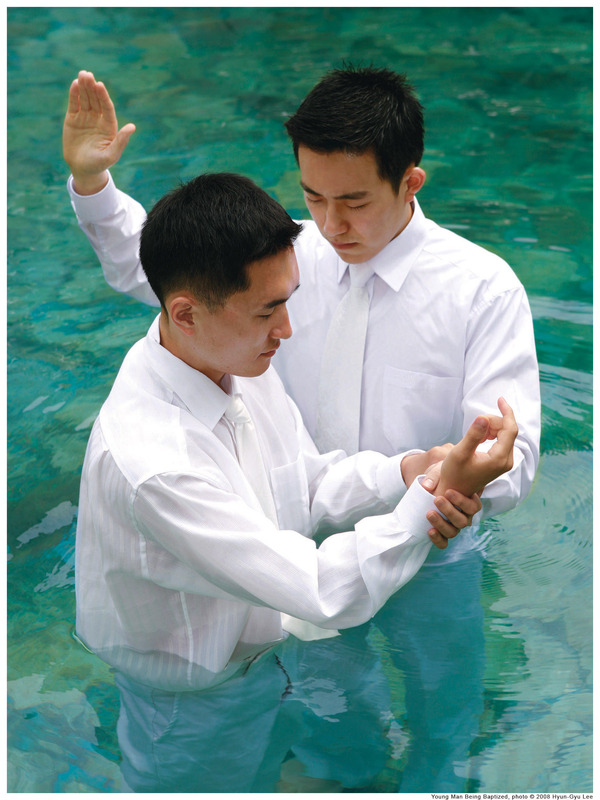 Mormons believe that baptism must be performed by the proper priesthood authority and in the manner authorized by the Lord. As a result, if someone who has been baptized in another church elects to join the LDS Church, they must be rebaptized. (I’m at least familiar enough to know that some Protestant churches accept the baptisms of other churches, but I have no idea which baptisms are compatible with one another). We are baptized by immersion because we believe that this was the manner in which John the Baptist baptized the Savior, and that it is a symbol of death (being buried in the water) and resurrection or rebirth (coming back up out of the water). Although Mormons are a missionary people, with over 50,000 proselyting missionaries serving throughout the world, baptism into the Church is not a quick or casual matter. There basically two avenues by which a person can be baptized as a Mormon. The first is what we refer to “child of record” baptisms. These are children of church members who have reached the “age of accountability.” In the LDS Church, that is the age of eight, which is when we believe children become old enough to understand basic concepts of the gospel and made a commitment to follow Christ. Before a child is baptized, they usually have attended church services, including children’s classes, for most of their lives. Those whose parents may have joined or returned to church recently might take the missionary discussions before baptism. They are then interviewed by the bishop of the ward (the leader of a local congregation) to ensure that they understand what they are doing and really want to do it. Where such children have fathers who are members of the Church, the father usually performs the baptism. (As an aside, this may be the thing I love most about being a Mormon: The opportunity to perform sacred ordinances for my children. I think it brings fathers and their children together in a commitment to Christ in a very unique and special way). The second route to baptism is convert baptisms. Where a person has an interest in the Church, they sit with our proselyting missionaries for a series of “discussions” that cover the basic and most important principals and ordinances of the gospel. Obviously, a person does not become a gospel scholar over a few weeks, but the discussions are sufficient to ensure that people understand key principles of the gospel and understand and accept the obligations and commitments that come with church membership. Thus, they learn of the nature of God, the ministry and atonement of Christ, the resurrection, and importance of prayer, repentance, and receiving the gift of the Holy Ghost. They learn of doctrines unique to the Mormons, such as the apostasy and restoration, the Book of Mormon, the word of wisdom, and tithing. After a person has heard the discussions and expressed a desire to join the Church, they need to demonstrate the genuineness of their intention by attending Church for a few weeks. We have no desire to have people join the Church with a half-hearted commitment and then drifting away after a short time. There is too much of that as it is, and for that reason we strive to make sure that folks build spiritual and social roots in the gospel and continue to develop those following baptism. Finally, a potential member of the Church is interviewed by a senior missionary to determine whether baptism is appropriate. The purpose of the interview is to ensure that (1) the person understands the nature of the baptismal covenant; (2) they have a commitment to live the principles of the Church; and (3) that there are no reasons why baptism might be inappropriate. For example, the interview should include inquiries about whether the person has engaged in serious past sins (like felonies or abortions) that the Church wants to be sure have been repented of. Also, in contrast to the common characterization of Mormons as a cult, if there are serious family objections to baptism, especially with minors, the baptism usually will not be approved. In some countries, baptism might expose the potential member to an unreasonable risk of harm or persecution, or might violate legal agreements between the Church and the government. Again, Mormons do not just baptize people willy-nilly or merely upon a profession of a person’s acceptance of Christ. We consider this an extremely important covenant and try to ensure that it is not taken lightly. A quick example of how all of this worked in my family: In 1973, missionaries knocked on our door, and my parents invited them in to hear the discussions. My mother and my brother and sister were interested in joining after a few weeks, but my dad was hesitant. Because of that, the baptism was delayed until my dad decided to join, because the missionaries were concerned that baptizing only part of the family could create a rift. My family was baptized, but I wasn’t, because I was only 7. When I turned eight, I was a “child of record,” and I was baptized by my dad. My baptism is a wonderful memory, even 40 years after the fact. Going into the water to baptize my future wife and later with each of my children has been an incomparable blessing for me (even when, as a result of a serious car accident, I had to have a friend help me to get my youngest daughter into and out of the water). These have been sacred family moments in which we have demonstrated our devotion to the Savior and our determination to follow Him. It is a covenant that I hope each of us endeavors to live up to every day.